It was a rainy start to the morning of December 2, 2018. 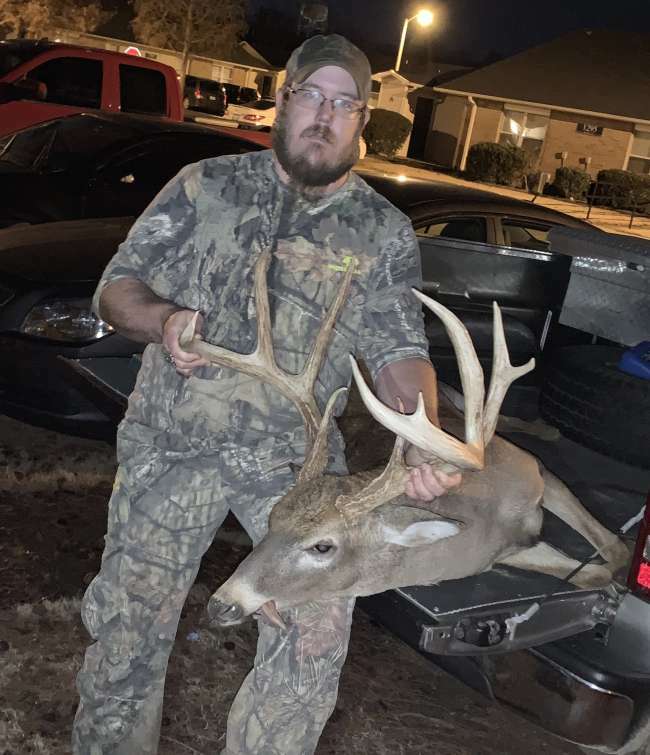 The deer hadn’t been moving for the last few days because of a warm front that moved in on North Mississippi. On this particular day, no one wanted to go hunting because of the heat. I decided to go anyway on this 73 degree day, and boy what a day it soon became. I got up the morning of the 1st around 6:30 to find it still raining. I decided I would check my weather app to see when the rain would be moving out. It said that the rain would be moving out around 8:00, so I got my gear together and headed out to some private land, that I have permission to hunt on, in Holly Springs, MS. The rain was still drizzling down when I arrived, but the clouds were beginning to break. As I made the long walk to my stand, i seen a couple of does grazing in a field over from the one I would be hunting in. I thought to myself then, this is going to be a good day. That all seemed to change as time grew closer to noon. Not one deer had made its way into my field, nor had I seen one in any other field except the two walking in. I was beginning to think, maybe I’ll just go back home. After a little thinking on how I only get one day a week to hunt, I decided to stay till dark. The whole afternoon was filled with the sound of leaves rustling in the wind and under the feet of squirrels running back and forth. Still no sign of any deer movement. That is, until around 4:45 that afternoon. A small doe appeared in the distance at about 250 yards. I watched as she made her way towards my stand. She got within 100 yards of the stand. My family are big venison lovers, so I decided that I would take the doe to process for my family. As I put her in the scope and got ready to take the shot, some movement caught my eye in the distance behind her. All I could see were big antlers scrolling across the tall sage grass about 250 yards away. When the buck cleared the tall grass and appeared in the opening, all I could do was watch in amazement. This was a big deer, the best I could make out. I watched him as he followed the trail of the doe, who now had turned around and was about 150 yards from the stand. She looked as if she had the intentions of staying that far out or even going further back. When the buck make it to the 150 yard mark I decided to take a better look. I was still amazed at the size but wasn’t sure if he was quite as big as I thought he was. After short debating with myself, I decided to take the next available shot. Once he turned broadside, I grunted fairly loud. This stopped him immediately in a heart beating standoff. As he stared back at me, I positioned the crosshairs to make a high shoulder shot. I took a slow calming breath and squeezed the trigger. He dropped in his tracks, got back up, then fell a second time. Amazingly, he stood up again before making it about 10 yards and falling down again. I knew that I had made a great shot with my Remington 270 4400 model. I was shooting 130 grain, Winchester Deer Season XP, ammo. After waiting about 30 minutes for him to expire, I got down and headed to him. Once the light of my flashlight hit him, he just kept getting bigger and bigger the closer I got. The buck that I was unsure of soon turned out to be my biggest trophy yet. He was a big mature 12 point, scoring 167 1/4”. After taking him to the taxidermist, I found out that this was a mature 5 year old brute of a buck. I had a great day hunting this deer and hope for many more to come.